Oliver Thermobag from new collection of the squash and badminton accessories. 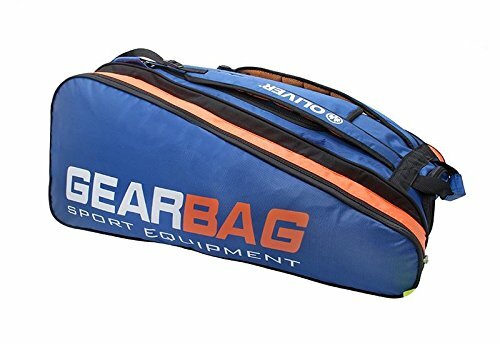 Large and roomy bag provided for 10-12 rackets. Ideal for everyday training and matches. The bag has three chambers: in the central part of the bag there is one large compartment with two-way lock, designed for example for clothes and accessories, in its interior there are two pockets made of sarcoplasmic finished with elastic band. two side chambers with zipps are ideal for storing rackets. The advantage of thermobag is two separate, ventilated shoe pockets. Easy access from outside raises his functionality. Thermobag has two adjustable shoulder straps with soft armlets, so that you can wear it on your back like a backpack. In addition, the bag has carrying handles in your hand. Three rubber feet allow you to place bags in a vertical position. If you have any questions about this product by Oliver, contact us by completing and submitting the form below. If you are looking for a specif part number, please include it with your message.